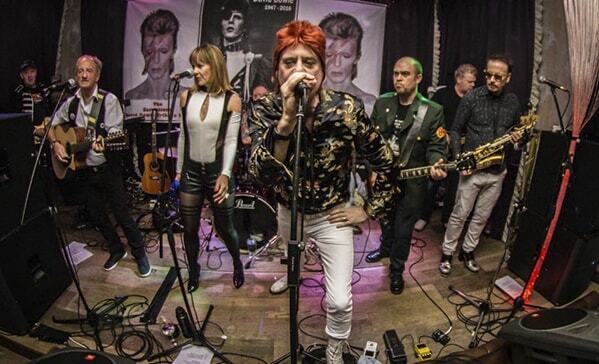 The Sensational David Bowie Tribute Band is the UK’s premier tribute to David Bowie. Witness firsthand all the glamour, passion, excitement and sheer electric atmosphere of the archetypal 1970’s Bowie Experience. All the early material is covered, in its wonderful, melodic, eclectic, yet easily accessible majesty. From the throbbing, sweeping Width of a Circle, through the colourful piano–driven material of Hunky Dory, the crucial era-defining Ziggy Stardust and Aladdin Sane albums, to the decadent malaise of Diamond Dogs and beyond, you need look no further. It’s all here. This unique act conjures up the blissful illusory experience of witnessing first-hand the magic of a heyday Bowie concert. If you want to connect with Major Tom and become mesmerised by Ziggy, look no further. Don’t go seeking it elsewhere; this is the only act that cuts it.